As interfaith wedding officiants we pride ourselves on creating a wedding ceremony that honors the uniqueness of your relationship. We interweave your beliefs, activities, interests, (anything at all ) that speaks to you as a couple. Religious,or not, spiritual, or nature inspired we work hard to make it speak to who you are. 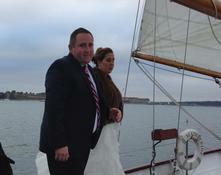 We offer handfastings,wine boxes,unity candle or sand, sailors love knot , wine ceremony,well ~ really anything at all. We pride ourselves on getting your service just right for just the two of you.